Cooking For One Cookbooks That Make Cooking For Yourself Fun! Cooking for one person usually means lots of boring leftovers and wasted ingredients. To help you feel less frustrated and more inspired we’re rounding up our favorite Cooking For One Cookbooks. They’re full of delicious single serving recipes, kitchen tips and more! We ask our new email subscribers what their biggest frustration is cooking for a small household. A lot of solo cooks say that resizing larger recipes is a pain and yields mixed results. But they put up with it because it’s hard to find good single serving recipes. The good news is there are quite a few Cooking for One Cookbooks filled with tasty recipes for one! Below is a list of the ones I’ve read with a brief overview of the recipes and the type of cook that will enjoy each book. Right now there are only three reviews. So I’ve also included a list of cookbooks we want to check out and review in the future. I’d love to hear your thoughts if you’ve tried any of them! Lastly, we’ve put together a list of Cooking For Two Cookbooks for those times when your table is set for two! One quick bit of business. This post contains affiliate links which means that as an Amazon Associate we earn a commission from qualifying purchases. Designed for One! : 120 Diabetes-Friendly Dishes Just for You by Nancy S. Hughes is a cookbook focused on healthy single-serving dinners. All of the recipes follow the American Diabetes Association’s nutritional guidelines. Chapters & Recipes: There are chapters for salads, starchy sides, non-starchy sides, chicken, fish, beef, and a whole chapter(!) for meatless main dishes. 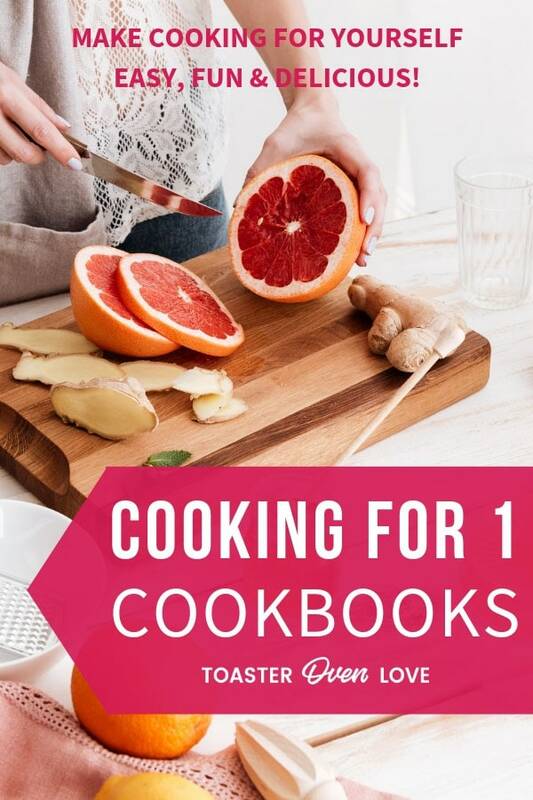 The Two-For-One chapter has 16 recipes that make 2 servings. These could come in handy for entertaining or if you’d like to have a prepared meal available for breakfast or lunch the next day. Most of the recipes use around six ingredients and have clear easy to follow cooking instructions. Also, there is full nutritional information and exchanges included for every recipe. Things You Should Know: One drawback is the lack of photography, only 16 of the 120 recipes have pictures. Also, many of the recipes are very basic flavor-wise. They make a great starting point if you like to experiment with seasonings and ingredients. But if you only want to follow a recipe, there’s a chance you’ll get bored after a while. Extras: There is a great ‘How To’ section. It includes tips for selecting and storing fruits and vegetables, shopping for one, and handy kitchen shortcuts. The author has also included an Extra-Easy Desserts chapter. It features healthier single serving desserts. Most of the desserts use fruit and require little-to-no cooking or baking. Your single friend or family member whose managing their diabetes and in need of budget-friendly easy recipes for one. Anyone cooking for one and looking to add more vegetables/healthy proteins to their diet without lots of leftovers. Cooking Solo: The Fun of Cooking for Yourself by Klancy Miller is a celebration of cooking for oneself. The recipes range from simple and classic to high-end restaurant fare. Chapters & Recipes: There are 7 chapters covering breakfast, lunch, meaty dishes, seafood dinners, vegetarian mains and sides, recipes for entertaining, and dessert. Most of the mealtime recipes call for fresh in-season vegetables and have easy to follow instructions. If you’re an omnivore or pescetarian, you’ll be quite pleased with the number of meat and fish recipes. Things You Should Know: Many of the recipes call for more expensive ingredients that could be hard to find locally. Things like chestnut cream, truffled cheese, pine nuts, and quinoa flour to name a few. If you’re looking for only single-serving recipes this book is not for you. There are plenty of one serving recipes. But some do intentionally make leftovers to eat later in the week. And there’s also a chapter full of larger recipes for entertaining 2 to 6 people. Extras: There’s a ‘Staples’ section with tips for purchasing and storing ingredients along with equipment suggestions for setting up your own gourmet kitchen. I’m not sure you’d call this an extra but I enjoyed the author’s writing style. Her excitement about cooking and desire to help you ‘treat yourself’ to a quality meal is sincere and present throughout the book. Single cooks looking to step out of their comfort zones. Fans of gourmet food that want to cook smaller portions of their favorite restaurant dishes. Small households that own a waffle iron, the author’s a big fan of waffles so there are quite a few waffle recipes. Healthy Cooking for Two (or Just You) by Frances Price, R.D. is a unique cookbook that takes the guesswork out of cooking for one or two. The recipes are low-fat with a focus on fresh ingredients, vegetables, and spices. Chapters & Recipes: There are over 200 recipes. With chapters for bread and breakfast, light meals and snacks, soups, salads, meatless meals, chicken, fish, beef, vegetables, and desserts. Each recipe includes full nutritional information. The recipes have a special format that features two ingredients lists. One list with measurements that range from 1-2 servings depending on the recipe. And another list with measurements ranging from 2-4 servings. This means you can easily double a recipe or make half! Things You Should Know: Some of the recipes do call for non-fat yogurt and cheese. Though we’ve had no problem substituting low-fat or full-fat ingredients in the recipes we’ve made. If you’re not looking to lower your fat intake or comfortable swapping ingredients, this might not be the cookbook for you. Also, while there are cute renderings throughout the book there are no pictures. Extras: This cookbook has loads of information any small household will find useful. There’s a ‘Kitchen Basics’ section with tips for shopping and storing ingredients. It includes 3 pages explaining the flavors and best uses for different spices. And if you struggle with planning meals there are seasonal menu ideas in the back of the book. In addition to the informative recipe headnotes, you’ll find little asides scattered throughout the book where the author shares more about a technique or specific ingredient. They make you feel like a wise teacher or friend is popping by to help you cook better and eat healthfully. Someone who doesn’t mind using a cookbook without any pictures of the finished dishes. Single cooks who want the choice of making extra or only enough for one. Anyone looking to cook smaller amounts of low-fat meals using simple budget-friendly recipes. What are your favorite cookbooks for solo cooks? Let us know in the comments below! The recipes for the most part are from another era – think 1950 and 60’s – Julia Child, (Judith was Julia’s editor) and a lot of people now do not eat the foods she writes about. (think , kidneys, liver, etc) Since I come from that era, I do. I love that her recipes have ‘reincarnations’ – what to do with the leftovers.